Okuhara Seiko was a late Edo and Meiji period literati artist. A painter, calligrapher, poet, teacher and martial artist, Seiko was born with the name Setsuko in the domain of Koga, to a high-ranking family of the samurai class. Young Setsuko would normally have been subject to an arranged marriage, however her class allowed for some freedom. Girls were not permitted to study painting as apprentices in the traditional workshop studios, instead Setsuko received private training from various artists and scholars, gaining a well rounded and diverse literati education. At twenty-eight, Setsuko moved to the capital of Edo (now Tokyo) to begin a career as an artist. Shortly after arriving in Edo, around 1865, she changed her name from Setsuko to Seiko, a name that gives no indication of gender, meaning “clear lake.” Seiko was a masculine, robust figure, wearing men’s clothes and short hair in a male style. A gregarious personality, quick wit, creativity, and penchant for conversation, made Seiko an extremely popular and sought-after personality at scholarly gatherings and parties. It did not take long for Seiko to become an established artist. Seiko was the first female artist to have an audience with the Empress, and Seiko’s home became a favorite gathering place for artistic and literary leaders of the day. Seiko opened a co-ed school in the early 1870’s. Seiko believed that girls who were serious about their education needed a place to study away from the demands of home. The school grew, reaching upwards of three hundred students, including geisha. Watanabe Seiran, originally one of Seiko’s students, was Seiko’s companion of more than forty years. Seiran was a talented painter in her own right. Not only did she manage the household and studio affairs, but she helped with the creation of commissioned works and the training of students. She was also responsible for the numerous study works and sketches necessary for the completion of paintings. Seiran emulated Seiko’s style so perfectly that it is difficult to tell their work apart without a signature. Fister, Patricia and Fumiko Y. Yamamoto. Japanese Women Artists, 1600-1900. Spencer Museum of Art, 1988: 161- 165. McClintock, Martha J. and Victoria Weston. 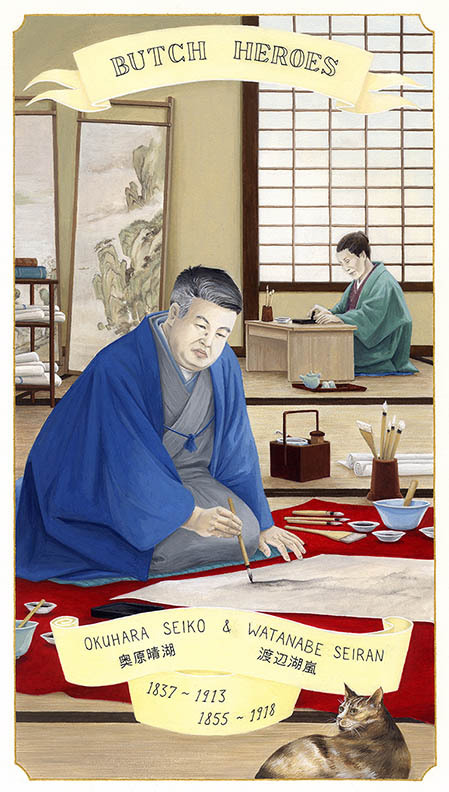 “Okuhara Seiko: A Case of Funpon Training in Late Edo Literati Painting.” Copying the Master and Stealing His Secrets: Talent and Training in Japanese Painting. Ed. Brenda G. Jordan and Victoria Weston. University of Hawaii Press, 2003. 116- 147. ---. Okuhara Seiko (1837- 1913): the life and arts of a Meiji period literati artist. Diss. University of Michigan, 1991.